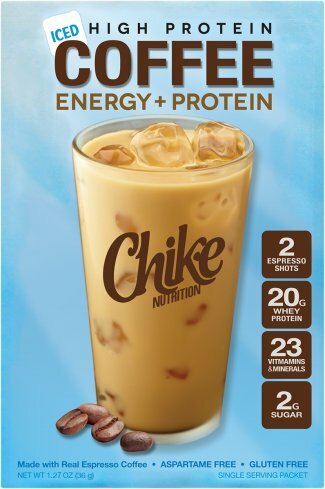 Chike Iced Coffee is a delicious way to enjoy your coffee and your protein! With 2 Espresso Shots, 20 grams of Whey Protein, 23 Vitamins & Minerals & only 2 grams of Sugar - it's the perfect drink to kickstart your day or fight the midday slump! The excuses for skipping breakfast are officially over! Iced Coffee drink is sold in individual packets with 1 serving each. This drink is caffeinated and is equivalent to 2 espresso shots. I thought I'd enhance the iced coffee, so I added decaf coffee as a substitute instead of water....then added crushed ice. It was extremely delicious, once i placed it in a Starbucks it really felt like a nice treat. I have a new favorite - Chike iced coffee. With all our foods available at the front desk, I find myself really enjoying a chike in the early afternoon to help fill me up, give a little energy boost, and make it so I'm not starving at the end of the day. 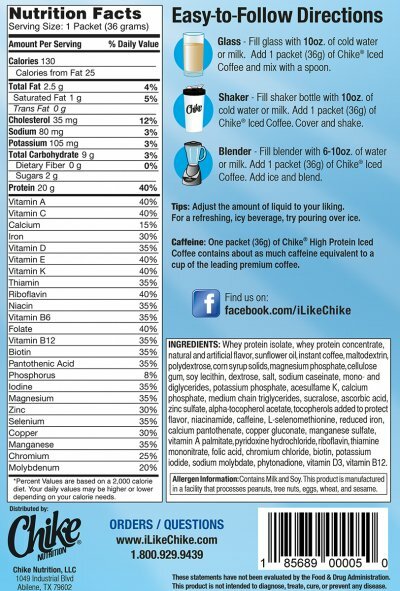 Cudos to Chike for making a drink with so much real coffee flavor!